Brazil nut belongs to the family of fruit and nuts which also contains other popular members like cranberries, blueberries, and gooseberries. True to its name, the nut is a part of Brazil tree, widely grown in Brazil, Chile, Peru, and other South American countries. It has a very high nutritive value. 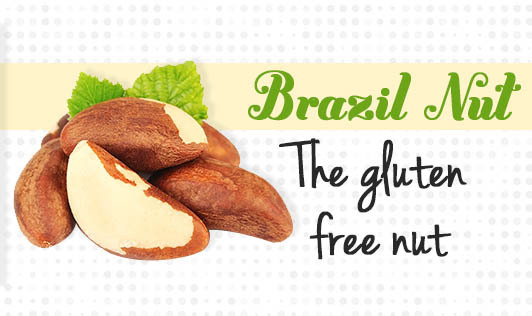 A 100g portion of Brazil nuts contains about 656 calories which constitutes a high calorie value. It contains palmetolic acid and oleic acid in high proportions which helps reduce LDL (low density lipoprotein or bad cholesterol) and increases the HDL (high density lipoprotein or good cholesterol), eventually helping the human body to maintain good heart rate and body metabolism. Brazil nuts is also very rich in Vitamin E which useful for enhancing immunity against allergies and other skin-related diseases. Additionally, Brazil nut contains iron, potassium, calcium, manganese, and zinc which are important micronutrients for the system. Potassium helps control heart rate and blood pressure, calcium helps in improving the strength of bones, and iron helps to increase hemoglobin in the blood. But the most standout property of these nuts would be that just like almonds, they are free of gluten proteins. This is why they find extensive use in the food industry, especially in the manufacture of gluten-free food products. The major advantage of this being gluten-free is that it can be consumed by people who develop allergies towards wheat products.